John is the best photographer in the area. The only negative is that it is so hard to pick a few favorite photos for an album because they are all so amazing! John was very flexible, taking photo requests we had throughout our wedding day. Even through the rain, our day was a success and the photos were flawless. Thank you so much John! 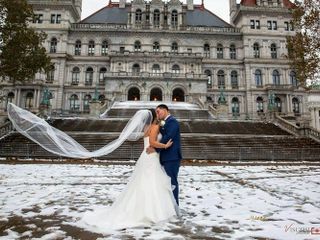 Let me begin by saying, I was totally bummed when I booked my wedding venue and my go to photographer was already booked.. I searched for days, weeks even! I am someone who does my research to the fullest before making a decision. After contacting John and meeting with him just days later, I knew I didnt need to search anymore! I hired him that day! BEST DECISION!! John is absolutely wonderful. We honestly could not ask for anyone better for our big day. The pictures we have seen are stunning and we are looking forward to seeing our entire album. John and his assistant showed up on time and got right to work. He went above and beyond with everything he did, even fixing my shoe when it broke and laying in scum water just to get the perfect shot. I’m still getting compliments from our guests on how wonderful our photographer was. 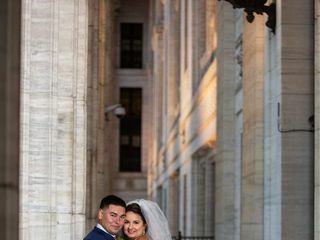 If you want the best of the best book Viscosi Photography for your big day! I don’t even know where to start, other than if you’re reading this, you need to book Viscosi Photography for your wedding!!! My now-husband and I both hate getting our pictures taken and John made us feel so comfortable within the first few minutes of our engagement shoot that we felt like models. On the wedding day, no matter what happened with the getting ready schedule, he kept us calm and laughing, while making sure to get key shots throughout the night! We can’t wait to book John for all of our family photos in the future. 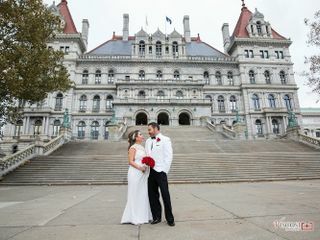 Our daughter Marissa used Viscosi Photography for her wedding. John was wonderful, easy to work with and very professional. Everyone has such a fun time with his photo booth and props. HIghly recommend his services for your next party or event! Words can’t even describe how amazing John was on my wedding day!! He made sure we got every photo on my list that I wanted without taking away time from the fun, we did a first look so he came even earlier to get getting ready photos and stayed the entire night. He was very accommodating and flexible with everything and put me right at ease, every moment was captured and we couldn’t be happier with his services ! He also did an engagement shoot for us which was awesome as well, he spent a few hours which was more than I expected and was able to get us the pictures pretty quickly so we could use them. Highly recommend him for anyone looking for a photographer, our pictures are absolutely stunning ! After our initial meeting we booked John Viscosi for our wedding photos before we even made it back home. We scheduled our engagement photos for October 2016. We got them back and were blown away by how stunning they are. They were better than I had ever expected. During our shoot John was creative, fun and made us feel comfortable. We told him we would like some pictures with our 1 1/2 year old son. It was getting close to bedtime and our son started getting tired and cranky but John did not bat an eye. He just kept on shooting and the photos turned out beautiful. We cannot wait for September to have him photograph our wedding, as I fully trust that they will come out great. John Viscosi was the best! He knew exactly what he was doing, took wonderful photos of our wedding, gave us a great package, and provided the photos to us exactly when he said he would! I would use him again or for our next big event! Highly recommend Viscosi Photography! John is a great photographer.We loved every picture! He made my wedding day go by very smooth and organized. We would highly recommend him! John was great from start to finish! He did our engagement and wedding photos and they were beautiful. We had two different locations where we needed him to take pictures and he was flexible and kept us on track with time. John was very personable and very easy to work with. Our pictures came out amazing. I would highly recommend him to anyone. John and his assistant were a pleasure to work with on our wedding day! They captured all the special moments throughout the day without being overwhelming. They rolled with whatever came up and were so much fun to work with. Very accommodating! John and his team were amazing for our day from start to finish!! The photo booth was a huge hit! John even managed to find a way to dodge the guest that thought she was the photographer all day and night! 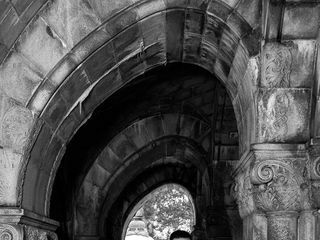 We even got a free engagement shoot with our package which we did at Yaddo in Saratoga with our family that came out wonderful! Can't wait to see all the photos!! We booked John for our July 2017 wedding and could not have been happier! From the minute he started shooting our engagement photos (with our dog! ), we knew we made the right choice. Our engagement photos came out beautifully and we were excited to use them on our "Save the Dates." Come wedding day, John and his assistant were awesome to work with....I forgot they were even there at some point because they were so good at being discrete. I was very impressed with how professional they were throughout the entire day. We just got our photos, and now we have the difficult task of picking out what ones will go in our album because there are so many beautiful ones to choose from! Thanks again John! John was an amazing photographer! He was willing to do our engagement shoot where we wanted and made it so fun and made us so comfortable! 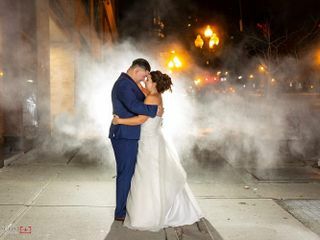 He took amazing shots through out our wedding night and his layout in the albums are breathtaking, when I received them it made me tear up and relive me amazing night all over again! We are so happy with his service and professionalism. He even went out of his way to ship us our albums since we are not local! 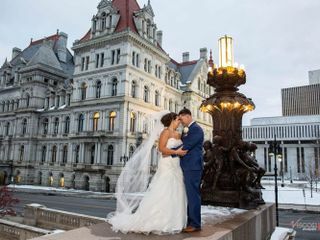 Amazing photographer who made our wedding the best it could have been! We couldn't have asked for a better photographer. He was on time with an assistant and took all the photos that we requested....and more. Very professional and excellent to work with. I would recommend him to anyone. We decided to go with Viscosi for our wedding photography and could not have been happier. The package we purchased provided us with engagement photos as well. John was very good about getting all of the shots we wanted while not intruding or interfering throughout the entire day. I would highly recommend them to anyone looking for a wedding photographer. They were very professional and the photos came out absolutely great. Loved every second working with John. He makes you feel comfortable and really knows what he’s doing. I️ would recommend him to anyone and everyone! John was absolutely amazing for both our engagement and wedding photos!! He made us feel so comfortable and was so flexible with whatever we wanted! Our pictures were beautiful and we have already recommended him to our friends for their wedding. It was great fun working with John for our engagement pictures. They looked awesome and I can't wait to see our wedding pictures!! John Viscosi is the best photographer around! He went above and beyond for me and my husband to make sure we had the best wedding pictures. We are so in love with our photos especially the ones of our one year old daughter. We can't thank him enough for everything he did for us. He is affordable and gives you more than you money's worth. I highly recommend him.